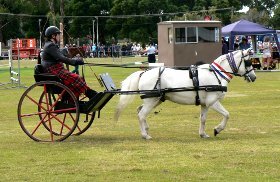 The Wynyard Agricultural and Pastoral Society hold the Wynyard Agricultural Show in March each year. The Show is one of Tasmania's oldest local shows, and still retains its classic country feel. Come and see the animals, watch the horses, or marvel at the giant pumpkins entered in the pumpkin growing competition. Axemen compete in the woodchopping arena and sideshow alley and show-bags are still favorites for the kids and "bigger kids". Wynyard is a centre of agriculture on the North West coast of Tasmania. It sits on the banks of the Inglis River sheltered by Table Cape, flat-topped and fertile. After the Show take a boat out, fish, ride a horse, swing a golf club or simply walk a coastal path. Explore Fossil Bluff, not far from the town centre, where you can learn about the age and structure of the soft sandstone bluff and follow a path to the top for spectacular views. Pastoral Society wish to thank our many sponsorship who helped make the show a success.